Every bride imagines walking down the aisle in the perfect dress on their wedding day. But despite the pressure to be picture-perfect on your special occasion, it isn’t as simple as just going on a crash diet in the months leading up to the event. Choosing the perfect wedding dress is no easy task. After months of sifting through endless cuts, shapes and sizes of dress, your dress fitting can be a disappointment when you discover the waistline is uncomfortable, your arms aren’t as toned as you’d hoped in the strapless model, and the backless design shows just a little too much skin. You won’t be able to lose weight in specific areas; that isn’t the way it works. However, combining weight loss with muscle toning exercises can help you achieve your goal, either for the whole body or specific areas to give you the graceful figure you’re after. To help you get the figure you want, and slip easily into the dress of your dreams, we’ve selected the 4 best exercises to target the 4 most problematic areas for each type of gown. With just 15 to 30 minutes per day you can start the countdown to the perfect wedding body today! Strapless dresses are a common choice for brides, as they create the illusion of a longer, more elegant neckline. To make the most of this feature, you can consider focusing on shoulder and chest exercises that can help tone and shape the entire upper body. This will help sculpt the deltoids, the muscles that form the rounded contour of the shoulder. 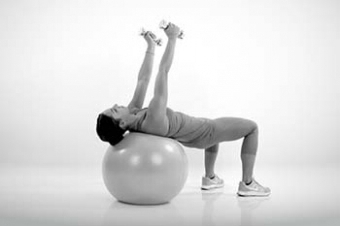 With the help of a Pilates/ stability ball you’ll be working your arms and strengthening both your abdominal muscles and back. You shouldn’t have to stand still with your arms by your sides for a dress to look perfect. Say goodbye to ‘bingo wings’ and feel confident to wave without wobbling. This exercise should be done with weights heavy enough to challenge you. 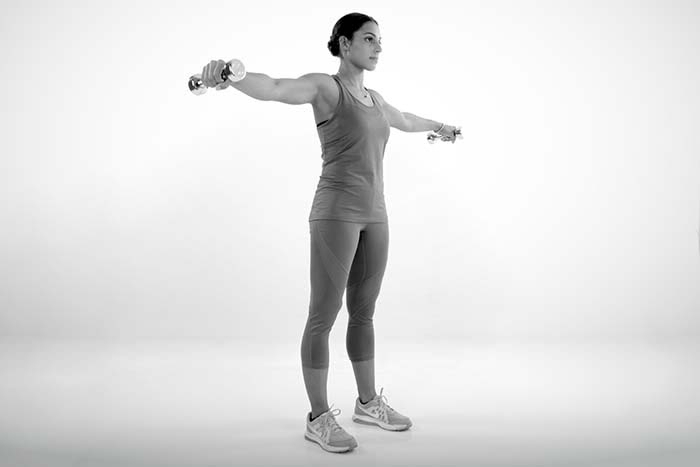 Use a dumbbell in each hand. Hold for a few seconds (minimum of 30 seconds) and progressively increase as your endurance grows. Dropped back or backless dress designs are among the most sought-after styles. You can combine the following set of exercises with the shoulder and arm workout above for a stunning result. With straight knees and aligned back, bend forward at the hip and contract your muscles to come back to an upright position, keeping your arms extended. Lying on your stomach, rest your chin on the floor. Extend your arms forward and raise your head. Inhale and contract your back, core, bottom and leg muscles, bringing your feet together and upwards. Hold the position. The rotation movement and endurance needed for this exercise guarantee that all your abdominal muscles will get a full workout. You’ll feel this tiny movement instantly when it’s done right. It’s simple but it gives great results to tone your tummy for the big day.